This PDF 1.5 document has been generated by Microsoft® Office Word 2007, and has been sent on pdf-archive.com on 16/08/2017 at 20:13, from IP address 88.117.x.x. The current document download page has been viewed 141 times. File size: 432 KB (6 pages). aggregation to get a optimal alignment. In this article, two objectives precision and recall are simultaneously optimized. method is compared with that of its single objective versions. Keywords: ontology alignment, particle swarm optimization, multiobjective optimization, f-score. ontologies comprised of several set of discrete entities. purpose which is modeled as multiobjective problem. 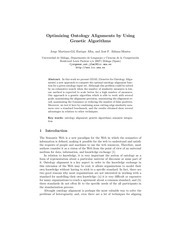 particle swarm optimization for ontology alignment. as opposed to a single perspective of ontology. optimization can formally be stated as [21–23]. been compared with the single objective versions. without simultaneous worsening in some other objective. for at least one j when the problem is minimizing one. front ,  or an approximation to it. particles moving around a D-dimensional search space. search space with the goal to acquire optimal fitness. alignment methods has been introduced in  and . a PSO technique is described in Algorithm 1.
particle are randomly chosen values between 0 and 1.
objective is computed as (1-recall). random values in the range of 0 to 1.
diversity of the Pareto optimal front. approximation of weights regarding optimal alignment. worst particle of the new generation. by the results of different algorithms. mean of precision and recall defined in equation 10.
created synthetic dataset. Let us assume two ontologies B.
associations exceeds a threshold value 0.8.
associations are (a1, b1) and (a1, b2) are shown. proposed method establishes its efficiency. Vol-11, No- 02, pp. 93-136, 1996. Semantic Web. Karlsruhe, Germany, 2008. Evolving.&quot; Journal of Information Science, Vol-28, No. 5, pp. 375388, 2002. Conference on Services Computing, APSCC'06, pp. 617-620, 2006. Martinez-Gil, Jorge, Enrique Alba, and José F. Aldana-Montes. Semantic Web. Karlsruhe, Germany. 2008. Sciences Vol-19, No-2 pp. 152-173, 2012.
to Automatic Schema Matching.&quot; the VLDB Journal, Vol-10, No. Knowledge Systems, pp. 71-90, Springer Berlin Heidelberg, 2012. Conference on Concept Mapping, 2004. Intelligence Magazine, Vol- 1, pp.28-36, 2006. Vol-2, No-3, pp. 287-308, 2006. Institute of Technology Zürich (ETH), Technical Report 43, 1998. Operations Research Letters, Vol-31, No-1, pp.7-11, 2003. Solutions: Techniques and Studies, Chapter 15, IGI Global, pp. 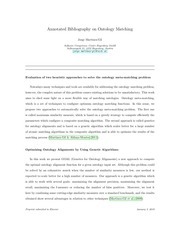 Euzenat, Jérôme, and Pavel Shvaiko “Ontology Matching” Vol. 18. Management: Ontologies and the Semantic Web, pp. 251-263.
and Simulation (CIMSiM-11), pp. 80-83, 2011. Vol-2, No. 3, pp. 287-308, 2006. Deb Kalyanmoy, Amrit Pratap, Sameer Agarwal and T. A. M. T.
NSGA-II.&quot; IEEE Transactions on Evolutionary Computation, Vol6, No. 2, pp.182-197, 2002. Algorithms. Vol. 2012. Chichester: John Wiley and Sons, 2001. Swarm Optimization and Intelligence: Advances and Applications. Hershey: Information Science Reference, 2010. Web.&quot;Scientific American 284, no. 5, pp. 28-37, 2001.
used for Knowledge Sharing?.&quot; International Journal of HumanComputer Studies, Vol-43, No. 5, pp. 907-928, 1995.
International Conference on Fuzzy Systems (FUZZ-11), pp. 17831790, 2011. This file has been shared by a user of PDF Archive. Document ID: 00648879.